"So tis true, do you know the culprit or are we in for more"
The ogre grabs his ale and follows. "Ya, we recently found some evidence pointing to Oof. We have to bring him in for questioning." Anvil grimaces at the mention of Oof. "That will be no small feat, I hear he is the leader of the local ruffian group here in the city." Anvil sits down and looks over to the others, "Will ye be needing help with the task? Do you even know where to find him ?" "Ai... The giant is our best suspect at the moment... We're hoping once we bring in oof things will begin te cool off a bit. Doesnt help that the people are getting frustrated with the watch, but now this harrow fella is stirring them up..."
the dwarf sets his helmet on the table and taps the dent on the side. "I was given a half-brick today fer me troubles earlier, the drunk called me a traitor. The watch has him sleeping it off still..."
Baethor stares sullenly at his beer for a long moment before he raises the mug to his lips again. "hmmm, I better inform my people to move around in groups and not go off alone from now on till this settles." Anvil mulls over what he has learned so far and stares into his mug. "Are the murders of anyone of political importance, or related in any other way?" "Nothing political...but they are all non-humans, all seven murders... I had thought it to be R'tiir and his assassins, or the remnant of the jovians, but we've not seen any evidence other'n the words "For Jove" written on the walls. Until tonight that is." In the back of his mind he muses why would Oof and his followers kill non humans, as far as he knew most of them were most likely of a non human race, and he knew oof wasn't human. Something is going on here that doesn't add up but he kept it to himself...for now. "Pardon me, sirs" whispered a cloaked man with a Mittlemarch clasp. He paused for a moment looking to Anvil and then the Dwarf and the Ogre. "It's fine soldier, Anvil can be trusted." "Ok, well Oof is going to be in Dunland this weekend for some festival. Might be a good oppurtunity to bring him in." "Thank you. That'll be all soldier." The man heads back out into the streets. "Alright, we'll make the arrest in Dunland. Anvil, you're more than welcome to tag along. Wouldn't mind having your eyes on our back." Baethor prods nichtmar to retrieve the peice of ripped cloth found near the corpse. "This is all we found at the scene, the symbol is that of oof's theives guild. Damming evidence at a crime scene to be sure." The dwarf finishes his second ale, and motions for a third. Leaning back in his chair the dwarf eyeballs the room as anvil inspects the evidence, seeing if anyone has ears to curious for there own good. Anvil hands the cloth scrap back to Baethor. "I'd be pleased to travel with ye to Dunland, it must be the winters eve festival in Gatereach that he is attending. I'll let a few of the Defenders know I'm planning on attending, that will give us more eyes to watch our back." Nichtmar really didn't care if the evidence was convenient. Oofs been undermining Mittelmarch for a long time. Finally he has evidence to bring him in. 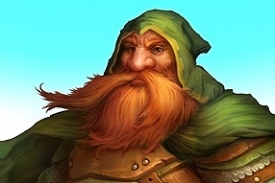 A figure in a green cloak sticks his head in the inn and scans the room till he eyes Anvil, he momentarly disappears and then enters with two other figures all bearing the badge of the Defenders. Anvil gives a sigh when he notices their entrance. "My babysitters have found me it seems, I know they mean well but sometimes a guy just wants to be off without anyone following his every step ye know." Anvil finishes his ale and picks up a piece of cheese from the platter. "I guess I need to go and check the security of my people and warn them about the murders anyway, and pack for the trip" he adds as he gives the ogre and dwarf a handshake. It had been a good day. With the onset of winter the years campaigning was winding down, and Oof was lounging by the fire. A noise from the surrounding woods drew his attention. He looked up to see Nichtmar, and Baethor lead a contingent of guards into the clearing. "Ah Nichtmar come to join me? looking for more information on the murders perhaps?" Nichtmar eyed the giant "You're under arrest" was all he said. Oof sighed "So it's to be like that is it? Very well"
Oof grabbed his club from the ground and stood to face the intruders. He knew his only chance was to take them quickly, but even as he circled hoping to catch them sleeping Baethor and Nichtmar closed in. Oof swung desperately at a guardsman, but the shot was easily blocked. Nichtmar used the opportunity to trap the giants club down low, as Baethor, using the flat of his great sword, smashed the top of Oof's shoulder. A shooting pain went searing down Oofs entire arm causing him to drop his weapon and fall to his knees. "So this is it" he thought as the guardsmen closed in around him and proceeded to beat him unconscious. A week or so later Oof sleeps in a pile of hay in his cell. Chains streaming from the wall connect to his wrists. Nichtmar walks in and pulls a lever. The chains yank Oof up and slam Oof to the wall, his arms stretched out. Nichtmar stands face to face with the giant. "Now you will tell me where to find the entrance to your guild?" Oof groans in from the pain in his injured shoulder. He cringes from the slight movement of lowering his head to look at the ogre. Fighting the pain he manages to get out the words. "So you've stuped to torture now, Sir knight?" "I will not be judged by a thief and a liar." The ogre targets the kidneys and slams a fist into the side of the giant and then the other side. "You think because I am a knight that I won't do what I must so justice is met. You already chose your path of darkness. You made yourself my enemy. We have worked together before, but we both know the darkness and the light cannot exist in the same place. You exploit the weak and I protect them. So keep your mouth on task and tell me where the entrance to your guild is." Oof moans as the Ogre's punches land true. Gasping for breath he manages to get out. "Protection...you protect nothing...tell me true Ogre...have the murders stopped yet?" Nichtmar was stunned by the answer. "The library?" The knight thought to himself as he walked out of the cell. He pushed the lever back to give slack back to Oof's chains and he headed up the spiral stone stairs. He didn't bother to turn as Oof dropped. His only thought getting Baethor and whomever else was there on the way to search the library. Anvil and a few of other Defenders were walking the market picking up supplies to keep them selves well stocked over the coming winter. The snow was already falling and dusting the land the last few days. nothing serious but definetly a herald of things to come. Some of the provisions were to be for a remote woodland camp just a few hours outside the city in case the city erupted in violence and he needed to move some refugees out for their own safety. It still troubled Anvil that the giant Oof was imprisoned and captured so brutally. He couldn't get a small nagging thought out of the back of his brain that something was wrong about the situation. He let the standing order that no defenders were to travel around the city in groups less than 4 remain in effect. More trouble was on it's way and he could sense it. Suddenly there is a loud knock at his door, startling him out of his thoughts. the dwarf replaces the azoth gate in its cloth covering, stashing the clothbound gem into a satchel and then again beneath a loose stone in the floor. the knocks occur again, louder then the last time. The dwarf walks over to the door and slides back a small window in the middle of the door. The gaurdsmen at the door seemed startled, but composed himself. "Sir nichtmar has requested your presence at the library, sir." The dwarf slid shut the window and opens the door. "don't call me sir, I work fer a living. I can guess why he needs me, so just tell the ogre i'll be along as soon as i'm armed and armored." The gaurdsmen nods and hurries off, as soon as baethor gets in his thicker clothes and a bit of armor, he slides on his helmet and cloak, pulls up his hood and heads towards the library. Another day wraps up in the Library of the Land Between. Here the elf known as Helvaryn rolls up scrolls he had been studying and scribing into a bound book. This elf’s past known to many as a simple librarian, but a few know that he came from a world where he was a master scout, a master thief, and a collector of ancient and priceless antiquities. He loves history and loves cataloging it. He arrived just after the fall of Isg’bel. He has traveled most of the Land Between collecting knowledge and artifacts and bringing it here to Mittelmarch. Some can be seen in the Library, but the dangerous items are locked away. The sun setting outside, he lights an oil lamp on his desk and takes the kettle of hot water and pours himself some tea. He sits back taking a sip. The warmth relaxes him as numerous thoughts start to trickle away as his mind begins to ease into a meditative state. The orange and purple of the sun finally fades to black. The streets are now quiet except for the occasional guard. With the curfew in place the nights are peaceful, until the occasional murder, a scream and the rush of guards and faces peering out windows was the normal orchestra of death those nights, but tonight was quiet. He packs his pipe and starts to light it with a candle. When he looks up he notices he has a late night visitor. A figure cloaked in blackness silhouetted by the light of the streets. He isn’t frightened. Nothing is said by the intruder. The assassin bows. Then suddenly a knife is flung from the darkness, the elf leans back in the chair as the blade soars over his face he rolls backward kicking the lamp toward the killer. He leans to the left as the lamp smacks the floor and ignites the carpet. Helvaryn produces a short blade from nowhere. Leaping over the desk as the readied assassin parries the stab. Their blades ring as they duel. The killer grabs the wrist of Helvaryn and a knee snaps the elf’s arm and his blade clanks on the floor. With a spin Helvaryn’s gut is bleeding and a boot to his jaw sends him flying over the desk. Scrolls and books fly and fall. The assassin is already on him with the edge of a blade to his throat. “Why are you doing this?” the old elf coughs. “It’s just a j…,” his words cut off as he splurts out blood. Helvaryn lets go of stiletto that he shoved under the sternum of the killer and pushes him off with his good arm. He crawls up the desk and lets it hold him up. He grabs a bottle of something filled with a brownish amber liquid yanks the cork out with his teeth and downs about half of it. Just then Mittelmarch guard run in stomping out the fire, followed by some dwarf he didn’t know, Baethor and Nichtmar. Oof sits quietly in his cell. The guards are dicing up the hallway when a low voice from outside the ventilation grate startles him. Oof strains to see who is outside "I'm here" he says "I thought i left instructions to go underground and not contact me?" The voice sighs "circumstances sir. We saw the guards carrying the founder to a healers hut. We don't know how badly he was injured, but he wasn't moving on his own." Rage boils through Oof "So the Ogre has declared war has he?" he says quietly. "Call up the entire guild" he says to the grate, "the people are not to be harmed, but i want the guards to suffer. If it isn't nailed down and it is in their homes steal it. If their purse is visible take it, if they resist the rule of not killing is suspended. Make them afraid to leave their house for fear of what we will do while they are gone. Make them tremble at the thought of crossing the guild"
"One other thing, protect the people. I want whoever was truly behind the murders found, and when they are I want people to see the justice of the guild..."
Healers take Helvaryn away as they look over the body of the assassin. Nichtmar eyes the room, guessing how the battle would've gone. "Anyone else suprised that the old elf survived this?" "What do you want Giant?" says one of the two guards. "Yeah, we're all out of babies." The two guards share a laugh. "eh, ya dont get old in this world by being complacent. Theives guild must've tried to keep 'im quiet about tha entrance to the guild. We may want to talk ta him once the healers 'ave done what they can. For now on to business..."
The dwarf looks back as several more dwarves enter the scene, all bearing the mark of the Bri'Ak-Duraz. Baethor explains the situation and sets them to the task of checking all of the walls and floors for trap doors. "Tha library is the oldest part of the keep, we built the new castle around it and repaired some of the walls, but its remained relatively untouched since we started living here. Ah wish i had some blueprints ta work from, but if there is a secret entrance 'ere then my boys will find it, the stone cannot withold its secrets from dwarves..."
Carneth cursed Dorian as he tossed another stone into the well, listening as the rock's progress echoed up from the long-unused depths. He'd been waiting at this abandoned watchtower for nearly two hours now, and the sun was starting it's retreat below the horizon. The dwarf froze when someone spoke from behind him. "You shouldn't disturb the depths of this land, dwarf. You never know what you may find." "And I suppose ye do know?" Carneth said before turning around to face the man. Dorian said nothing. "I sup'ose ye're wonderin' why I asked t' meet with ye. We need answers, and soon. Even with Oof in jail, the killin's still happenin'. So what can ye tell me?"